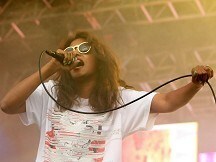 MIA has posted a song online about dying at 27, which she has dedicated to Amy Winehouse. The Paper Planes singer took to Twitter to link to the demo, writing "R.I.P.A.M.Y". The song recounts drinking in a London pub with a friend who apparently predicted her own untimely death. The lyrics include phrases such as "you said you'll be dead at 27 when we drunk in a English tavern". At the top of the lyrics MIA wrote: "Dedicated to all my friends that died at 27." The song has already notched up more than 200,000 plays in total.